Many Chicagoland couples drive to Starved Rock Lodge (starvedrocklodge.com) to host their wedding. A basic wedding for 100 guests in the Great Hall runs about $6,000 to $8,000. Couples often rent a trolley to transport the wedding party around the Starved Rock State Park and into one of its light-dappled canyons for an awesome photo shoot. At the Eagle Ridge Resort & Spa (eagleridge.com) in Galena, the wedding guests can stay in lodge rooms or one to six bedroom houses scattered throughout four golf courses, 20 miles of hiking trails and a 225 acre lake, where the resort’s hot air balloon floats overhead. The average wedding ranges from $12,000 to $20,000 in the ballroom or starts at $15,000 on the Point Patio, where sunsets over the lake provide a dramatic backdrop. The Illinois Beach Resort (www.ilresorts.com) in Zion provides a scenic paradise against a beautiful back ground of Lake Michigan for your outdoor wedding. The resort is nestled along the coastline’s over 4,100 acres of natural beauty in a protected state park. The chefs are very creative with their three course full meal menus, and prices are very reasonable. There are several hotel rooms at the resort for your wedding guests. Amenities including a swimming pool, restaurant and spa and fitness facility. Couples can have an inexpensive beach wedding without traveling to the tropics if they share their vows on the sand of the Indiana Dunes (indianagunes.com) at Chesterton. Ceremonies are restricted to 6:30 pm or later. Alcohol is not permitted. Couples can rent a shelter house, seating as many as 80 guests with picnic benches, and have a catered meal or provide a picnic for their guests. The fee for the ceremony is $50, and shelter houses range from $35 to $65. Guests can spend the night in one of the Dunes bed-and-breakfast inns or chain motels. After a ceremony in the 1911 Round Barn Theater, guests dig into family a style dinner or specially prepared buffet served in the old Barn Restaurant at Amish Acres (amishacres.com) in Nappanee. The 80-acre historic farmstead has two country inns for guests. Weddings range from $3,000 to $15,000. 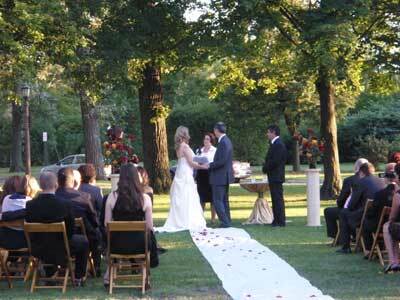 Among the state's most popular wedding spot is Frederik Meijer Garden & Sculpture Park (meijergardens.org) in Grand Rapids. Couples often exchange vows at a 30 foot waterfall surrounded by sculptures. This is also a photographer's candy land. Often couples from the Chicago area will have their wedding in the garden because it's more affordable than one at home. An evening ceremony at the waterfalls followed by an indoor reception ranges from $5,100 to $8,100. Beside the Bay Pointe Inn (baypointeinn.com) in Shelbyville at the Lakefront Pavilion overlooking the lake, the newest ceremony spot is the historic Boat House Villa. A four bedroom house with lakefront patio accommodates weddings of as many 150. Weddings in June start at $5,000, which is the most expensive time. American Club, where lots of Chicagoans will exchange their vows on the Whistling Straits Golf Course, overlooks Lake Michigan. The rustic Irish Barn on the 18th green rents for $400 with a $13,000 minimum food and beverage package. During their stay, guests can enjoy golf, a Kohler Water Spa, trap shooting, and horseback riding. The Osthoff Resort (www.Osthoff.com) on Elkhart Lake has 500 foot sand beach and watercraft rentals, an Aspira Spa, as well as the L'ecole de la Maison French cooking school. Most weddings with 100 guests start around $6,000. Interested in knowing more about planning a destination wedding or event? Call Windermere Elegant Weddings & Special Events 847-309-9478.